For library 39, I made a low power modes library. This allows you to simple put STM32F4 into SLEEP, STOP or STANDBY mode. Point of this modes is simple. You want decrease current on device. If you are working on battery project, this will be very helpful. You can set current down to about 2uA with proper low power mode. I will tell you only the highlights of all 3 power down modes in this post. For detailed informations, check ST’s manual here. You can also test, if system was reset because of wakeup from Standby mode. PA0 If STM32F4 is in standby mode, rising edge on this pin will wake him up if it is activated. Highlights below are from st’s manual from their website. How to enter this mode? Look for example 1 below. How to exit this mode? Any peripheral interrupt acknowledged by the nested vectored interrupt controller (NVIC). 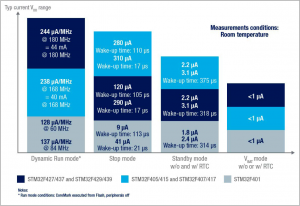 Systick timer will also wake up MCU! After exit, MCU continues where it stopped. All clocks in 1.2V domain are stopped. PLL, HSI and HSE RC oscillators disabled. Internal SRAM and register contents are preserved. Voltage regulator in low-power mode. Look for example 2 below. Any EXTI Line (Internal or External) configured in Interrupt/Event mode. After exit, MCU continue there where it stopped. HSI is used for system core clock, but my library set it back to PLL as source. 1.2V domain consequently powered off. SRAM and register contents are lost except for the RTC registers, RTC backup registers, backup SRAM and Standby circuitry. Look for example 3 below. RTC alarm (Alarm A and B) and wakeup. External reset in NRST pin. Main digital supply is turned off. The circuit is supplied through VBAT pin which should be connected to an external supply voltage (a battery or any other source). RTC is running in this mode. If you disable main power and put supply voltage on VBAT pin, then MCU will be in VBAT mode. Put power supply on main Vdd pins. If you put your STM32F4 into low power mode, it will become unavailable for normal programming. You will have to program it under reset mode or wake it up before programming. * MCU will be in sleep mode until next interrupt occured. * This means, that delay timer (Systick or any user selectable delay timer) can wakeup STM32F4 too. * If you want prevent this, you have to disable delay timer as well it. * MCU will be in sleep mode until next event occured. * Enable wakeup pin, fixed pin, PA0. * Rising edge of this pin will wakeup MCU from Standby mode. This example will put STM32F4 into sleep mode. RTC is configured with internal clock to generate wakeup interrupts every 10 seconds. After STM is wake, it will toggle green LED 20 times (10 times on, 10 times off) and MCU will go to SLEEP mode. Each time MCU will be waked up, RED led will be toggled. If you put Ammeter on IDD pins on STM32F4/29-Discovery or Nucleo board, you will see how current vary. Main difference between SLEEP and STOP mode is that in sleep mode only processor sleep, peripherals work, in STOP mode everything is stopped, except EXTI. All examples are available separately on Github, download library below. Allows you to put STM32F4 dvice into different low power modes.